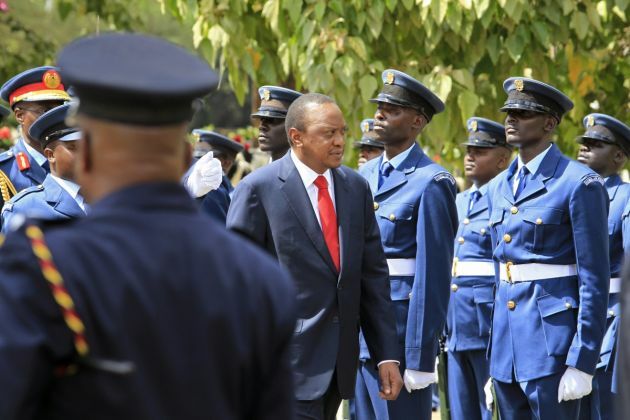 (Photo: REUTERS / Noor Khamis)Kenyan President Uhuru Kenyatta inspects a guard of honour as he arrives at the Parliament Building to deliver his state of the nation address in Nairobi March 27, 2014.
International election observer missions have warned of election chaos risk if there is a perception that the electoral process in Kenya is mismanaged and the murder of a top electoral official has heightened tensions. South Africa's State broadcaster, SABC said the groups include the European Union, Kenya's National Cohesion and Integration Commission, as well as several local and civil society organisations have raised these concerns ahead of the August 8 elections. Church leaders in Kenya are urging peaceful voting and acceptance of results, in an effort to forestall violence during and after the general elections, the World Council of Churches said Aug. 3. Anxiety soared after a Kenyan election official was found murdered earlier this week. He was found dead from manual strangulation and had incision marks on his right forearm, Kenya's chief government pathologist told CNN on Thursday. The official, Chris Msando, was head of information technology for Kenya's Integrated Electoral Management System. His department is responsible for voter-identification and result-transmission technology for the national elections. The National Council of Churches of Kenya and the continent-wide All Africa Conference of Churches, Kenyan communities expressed their hopes for peace in the lead-up to the elections. On Aug. 8 more than 19 million voters will cast ballot to elect a president, senators, governors, representatives and civic leaders in hotly contested elections. This is the sixth general election since declaration of multi-party democracy in 1992 and the second under a new constitution – agreed upon in 2010 - which is pegged on devolution of resources and good governance, Fredrick Nzwili reported from Nairobi for the WCC. President Uhuru Kenyatta, a Roman Catholic, the leader of the Jubilee Party and Raila Odinga, an Anglican who leads the National Super Alliance, an umbrella opposition coalition are the front runners. The elections have attracted eight presidential candidates. Analysts say the elections are significant for the citizens, but are also closely being watched in the region, where several countries are in conflict. For decades, Nairobi has acted as the pivot for UN and humanitarian agencies, which move humanitarian aid to the neighbouring countries in conflict. These include South Sudan, Somalia, Burundi and the Democratic Republic of Congo (DRC) whose relief operations are managed from the city. As the campaigns entered the final stretch, church leaders were urging a large turnout, but as they stress free, fair and credible elections, fear over post-election violence has also heightened. On July 2, the national churches council urged the frontrunners to calm the country, amid reports that residents fearing violence were moving from Nairobi, Nakuru, Eldoret and Mombasa cities to rural areas, where they hope they will safe. "They (front-runners) must assure the country that the heated messages expressed in campaign rallies are political, not a provocation to violence and ethnic division," said Rev. Canon Peter Karanja, NCCK general secretary in a statement. The churches have emphasized peace and security as paramount during and after the elections. They have reminded Kenyans of their responsibility to reject any provocation to incite violence. The churches, mosques and temples are neutral, according to the leaders, even though most leaders have a religious affiliation. The leaders have in the past been accused of accused of taking sides. "The Kenyan churches do not have candidates, but their followers will vote for candidates that are on offer - some of them who are church members," said Karanja in late July. Ten years ago, the role of the faiths as peace makers registered strongly, when the groups found themselves compelled to deal with the aftermath deadly post-election violence, in which thousands were displaced from their homes. At least 1,200 people were killed and over 600,000 forced into camps during violence that occurred between 27 December 2007 and 28 February 2008. The violence ignited after Mwai Kibaki, the incumbent president, was declared the winner and the main opposition leader Raila Odinga rejected the result as rigged. Now, Kenya cannot afford a repeat of the violence, the leaders say. "It is very unfortunate that exercising of our democratic right, turns out to be such a fearful event," said Rev. Connie Kivuti, general secretary of the Evangelical Alliance of Kenya (EAK). "The right to make a democratic choice and decision ought to be done without fear," stressed Kivuti.